Communications Unlimited offers video conferencing systems to provide your business with integration of visual communication into daily processes and workflows. 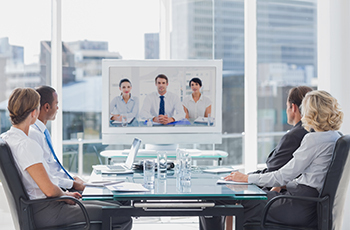 Effective video conferencing systems increase employee productivity through collaboration on projects from multiple locations, which dramatically reduces downtime and increased profitability. Multiple teams of people can communicate and share knowledge more efficiently. Information can be easily disseminated between employees, customers and partners. Provides a rich multimedia experience, boosting productivity and allowing for increased collaboration. Reduces travel costs and time. Our expert team of designers and installation professionals can build a custom video conferencing solution which will meet your expectations and specifications, while fully integrating with your existing room environment. Our team of professional installers have years of experience in installing multimedia systems in: boardrooms, conference rooms, training facilities, waiting rooms, and other specialized areas. Please contact our company for a free consultation for your next video conferencing project.